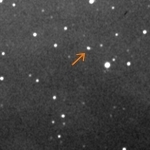 Images show a motion of an asteroid 2004 FH. 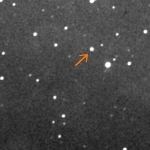 Images were taken on 2004 March 17 with 1.06-m KLENOT Telescope + CCD camera Photometrics S300 of the Klet' Observatory and is 15 seconds exposure. 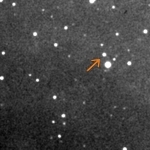 Minor planet is arrowed. Information about discovery and follow-up was published in MPEC 2004-F24.